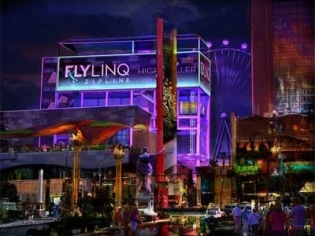 Fly Linq is the first zip line on the Las Vegas Strip; it was developed by the same team behind the High Roller observation wheel at the Linq. The ride features 10 side-by-side zip lines, which will allow all 10 riders to launch at the same time. You begin your ride experience by taking an elevator ride that provides open Strip views from the Vortex to the top of the 114-foot-tall launch tower. You can enjoy great views of the Vegas Strip on the elevator ascent. Once you exit the elevator you arrive on a launch deck where the gear fitting takes place. You then soar 1080 feet above the crowds below from the mouth of the Linq promenade all the way to the High Roller. Riders can choose to ride seated or superhero style.